The G-Force motor analyser has been on the market for a while now. So I was keen to take a closer look. The main question many have about these is "Will it make me go faster?" So let's investigate. I think everyone is agreed that brushless motors are one of the best things that has happened to the world of RC racing for some time. They have taken away lots of the maintenance issues and also removed some of the dark arts of motor tuning. Essentially if you see a guy with a fast car, if you buy the equivalent motor you should at least have parity in speed.. or will this little box prove that wrong? The main unit is made from aluminium and feels sturdy. There are 3 lights to show the status of the 3 sensors, a range of lights that show the throttle level and a jog wheel. It also has a cradle that you can mount the motor onto. 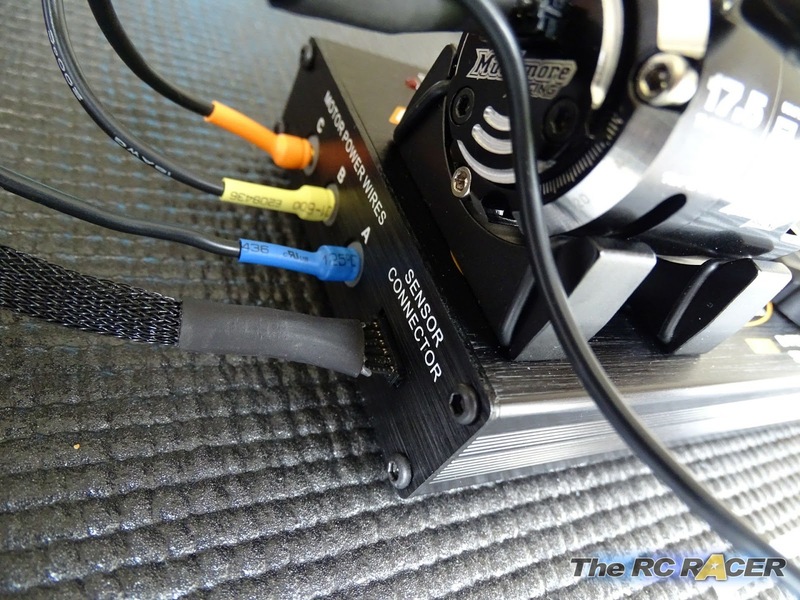 It is very easy to set up, you just need to attach the included cables to the box, rest the motor on the stand and use the crocodile clips to connect the A,B and C wires to the corresponding tabs and plug in the sensor cable. Now attach the power cable into the box and plug it into the battery to power the unit. They recommend using a 7.4V 2S lipo. As you can see in the picture the 2x16 character LCD display is very clear and easy to read.and you have 4 different modes that can be selected via the jog wheel. You just need to rotate it and press down on it to select. This mode is the most important one, it shows you the Motors KV, the Voltage you are supplying via the battery, the Motors revs and the amount of amps that it is drawing from the battery to achieve it. KV and revs are intertwined. KV is the amount of revs that a motor outputs for every 1 Volt of power that is being supplied to it. So for example if a motor has 2000KV then it runs on a 8.4v lipo it will produce 16800 Revs under no load (2000KV*8.4V = 16800RPM). 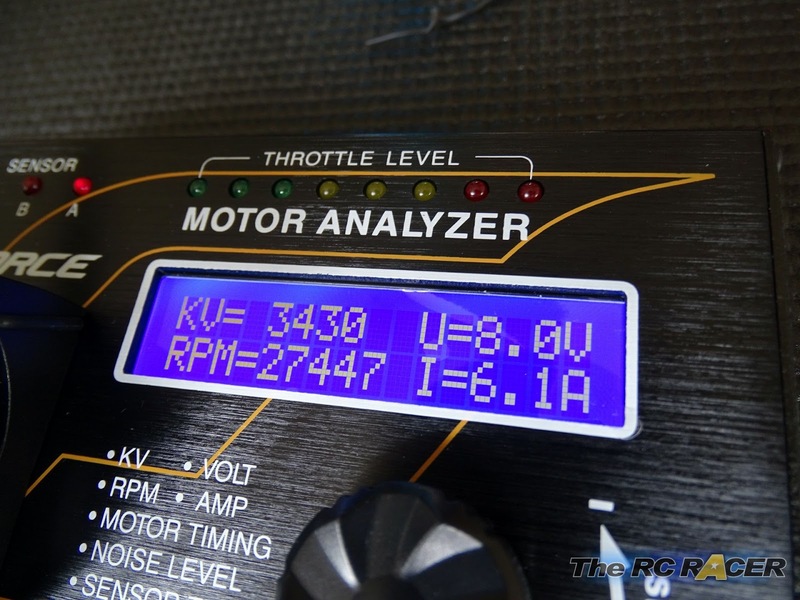 The input voltage is the amount of voltage that your power source is supplying to the motor. More volts = more revs but you will still have the same KV. Current is the amount of power that the motor actually uses to spin up. It's a little like the amount of horsepower that you need to turn the motor. The current that flows through the motor so spin it up is shown as amps. The more amps you need the hotter the motor will become. 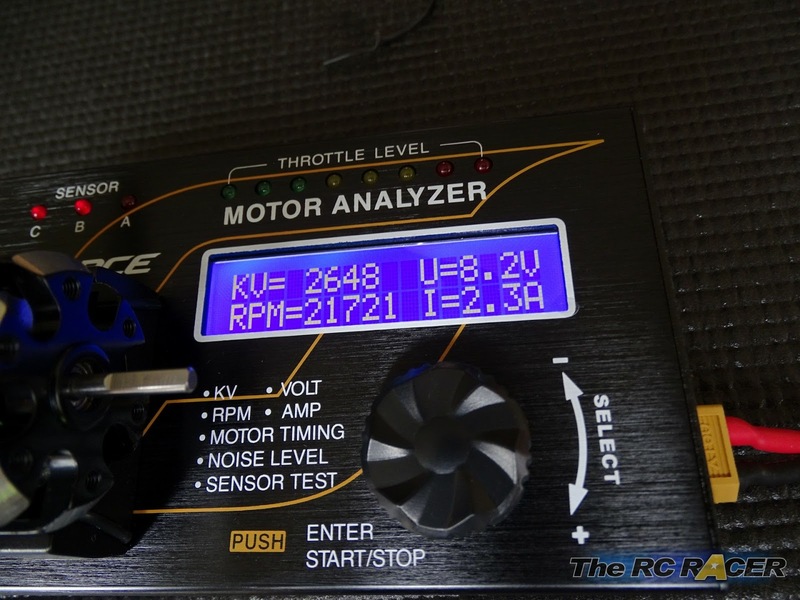 With the motor connected, you select the mode, press down on the jog wheel and then twist it up to spin the motor until the throttle level lights are all illuminated. Leave it for just a few seconds to settle and press down again for it to stop. The above is the reading I got from my 17.5 motor. 2.3 Amps is very efficient, and in real terms it probably means that I can supply more current to the motor to spin it up further. On UK tracks a range of around 5-7 amps has been touted as a value to tune towards for blinky running so let's take a look at what that will achieve. I experimented with adjusting the motors endbell to add more timing. 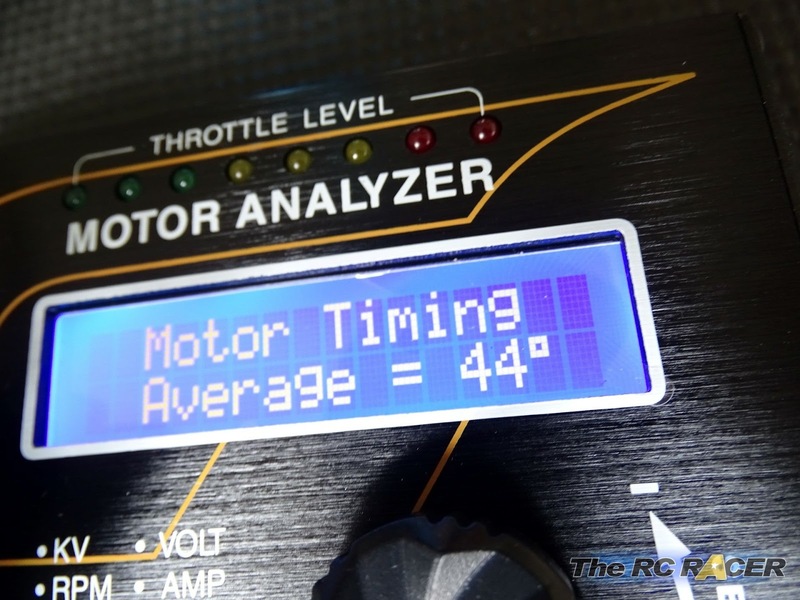 Less timing = Less revs more torque. Warning: Always be careful when revving motors without load, you could damage your motor if you do it too much. So the more timing you add to the motor the higher it will rev, and to achieve this it will supply more current to flow through the motor (measured in amps). The more you adjust it you can see that at some point your motor will fall off a cliff in efficiency. If I whacked the timing on maximum I got 3497KV which was a massive jump from 2648, however it was using loads of current (13.8 Amps) which would ensure that the motor was not efficient and I knew that my MM motor would be far too hot after a 5 minute race with that sort of load. I started to dial it back even just a small adjustment on the endbell moved it down to a reading of 8.5amps, but I moved it back and settled on the following. As you can see the amp reading is much more manageable, and I only lost a few KV (67) with less than half of the highest amps reading. So I would say this motor is good for me to give it a test on the track. Again as you would expect you need to be careful, as all tracks / drivetrains and motors are different. So run it and take it off the track to check the temps after a minute or so and adjust gearing or even the timing if it all seems funky. 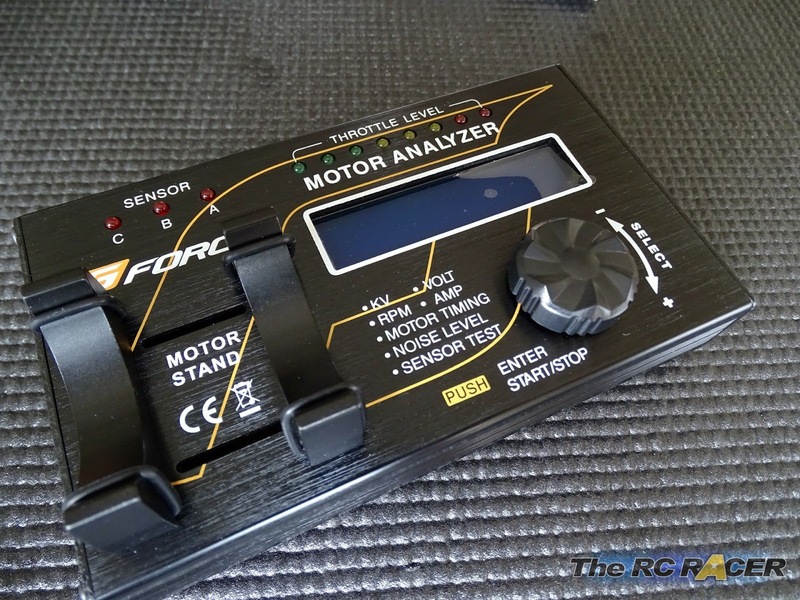 To be honest this is the most important mode for me with this analyser as it allows you to see what the motor is actually doing at full throttle so you can at least have a gauge on what it might achieve when on the track. This mode shows the actual motor timing that you have. It may come as a surprise for some but the actual motor can is never that great at giving you an accurate number. It is ok for you at the track, as you move the endbell relative to it's own position, but the can might say that a motor is 30 degrees when it actually may be more or less than that. When you select the mode, just press the button and the motor will spin for a short period of time and show you the timing setting. There are 3 sensors in a brushless motor and they should all be equally spaced apart, however that is not often the case. So the timing shows the average timing value from all 3 sensors. It also shows the actual individual sensor values. Here you can see that there is overall a 5 degree range between these sensors. Theoretically if they were all the same the motor would be smoother and more efficient. As a rule we are only talking about a small amount of better efficiency, so most people are just fine to leave it where it is. However if you do want to try to make it better you can re-solder the sensors (Not advisable) or the more simple thing to do is to try to shim the motor closer to the sensors. **Note do this at your own risk, you can seriously damage a motor if you dissemble it and shim it incorrectly). Most motors have brass shims that you can replace and move the rotor position. 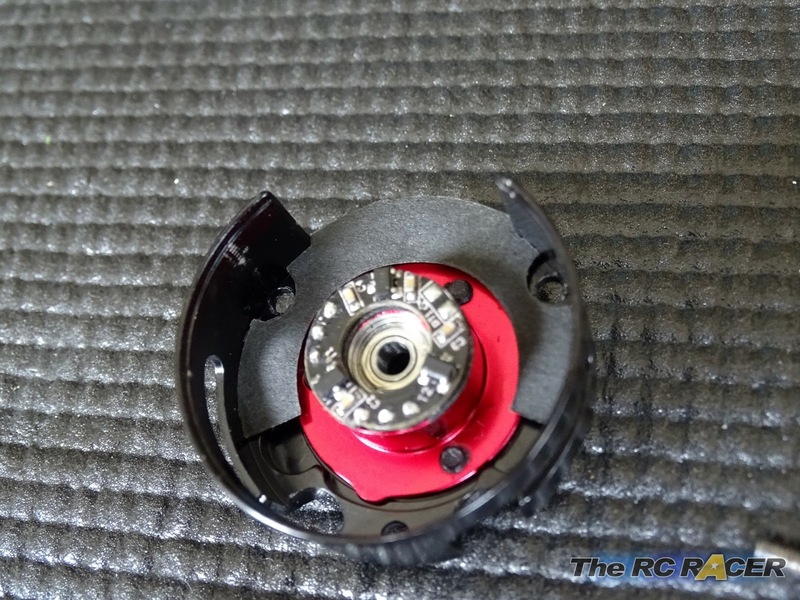 You have to ensure that you have enough space between the sensors and the rotor (say 1mm) so they do not rub together. Otherwise you will likely destroy your motor. You also want to check that there is very little play in the motor when you pull the pinion shaft once assembled. You need a small amount of play, otherwise you will add binding to the motors rotation and that will damage it. 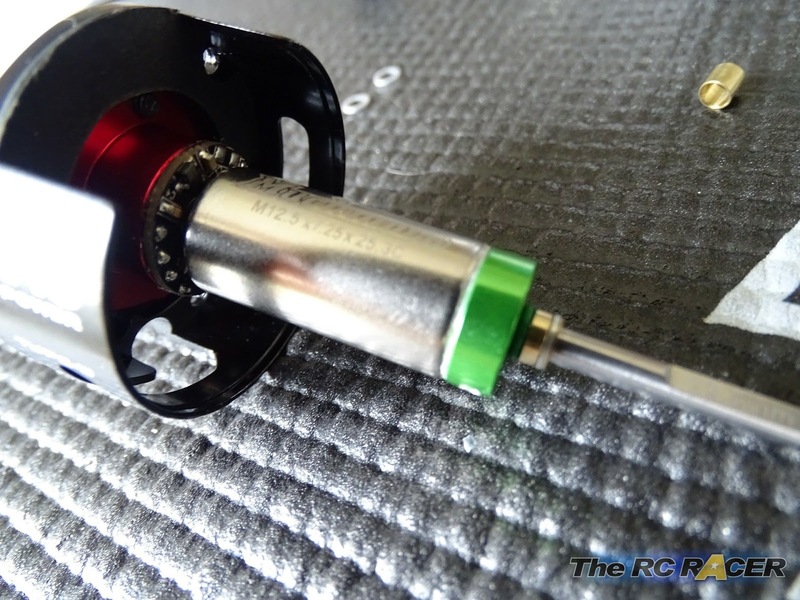 You just would want to remove excessive amounts as otherwise the rotor can move around a little and that will make the timing values fluctuate a little on the motor, making it again less efficient for tuning. With the motor shimmed I managed to get the timing within a 3 degree range. The KV increased by 14 and the amp load was 0.1 lower, it was a lot of hassle and that difference is absolutely negligible.. although as we know sometimes in racing its the small gains that can help. Although if you clip a barrier this sort of advantage is absolutely worthless. This shows the DB level of the motor. Essentially if a motor has a high DB it may be because the rotor is not rotating well, something is loose etc. My motors were all fine except one old speed passion. I took it apart and noticed that the bearing was quite notchy (it was very old) so I replaced the bearing and the DB level was much lower (Around 15 db). This would also make the motor slightly more efficient as it would rotate more freely... although I didn't get any before or after numbers. Checks the sensors all work. It does this as a matter of course when the motor spins in the other modes, although if you have a motor that doesn't work, this might help. I didn't have any call to use it so nothing much to report on this mode. The most important thing was to see if all of this messing about with the motor made much of an effect at the track. 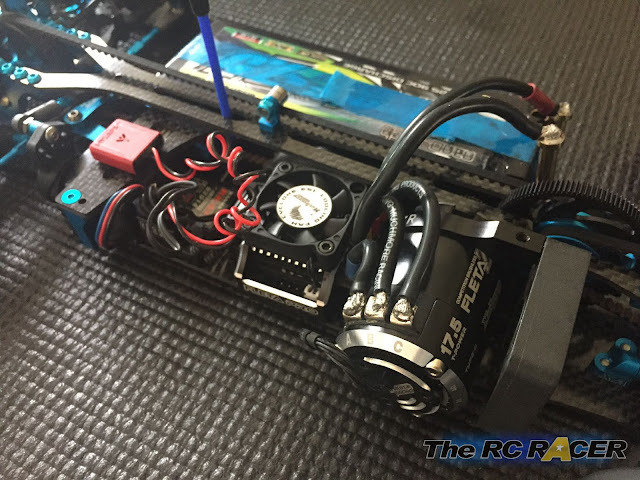 The car did feel very quick as soon as I started the first race, I had been messing around with my Fleta Pro and I was convinced that I had left some timing on it as the car did seem to me much quicker than I was expecting it to be. At the end of the race my temperature was just 76 degrees C. This is a very comfortable temperature and nowhere near the 100+ degrees that can start to damage the average brushless motor. Also as the temperature was low it ensures that the car was fast all of the way through the run. I played around with gearing as the track was very tight and the straights were small so I mounted a smaller pinion to get more speed around the infield and the car was quick and came off even cooler at the end of the run (71). I kept it there and have been running the car since with this setting and it seems to be performing well. I also checked the maximum revs that the motor achieved when racing (The Fleta Pro gives you the max revs for the last run). Looking at the program box I achieved 19874 revs, and on a track with a longer straight I may have got a little more. This however it is much lower than the KV setting of 27447 revs shown when on the motor analyser, this is because it achieves that figure without any load on the motor. This is important as Torque is not ever going to be shown with this device. To achieve this you need a Brushless Motor Dyno. 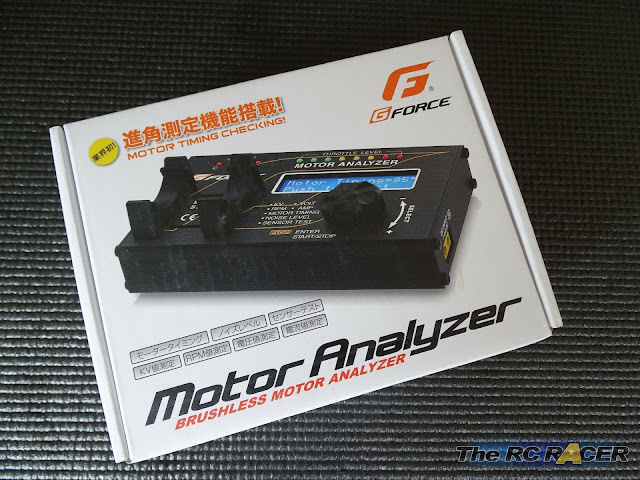 The motor analyser is an interesting device, it does give you some data on how you motor works, and it also allows you to have an idea on how all of your motors compare against each other on the bench. Importantly though it is not a fully fledged motor Dyno. The readings for the KV are all when you are not under load so you will not see how much torque a motor has. As an example I had a Trinity D4 and a very well used Turnigy 17.5 motor. 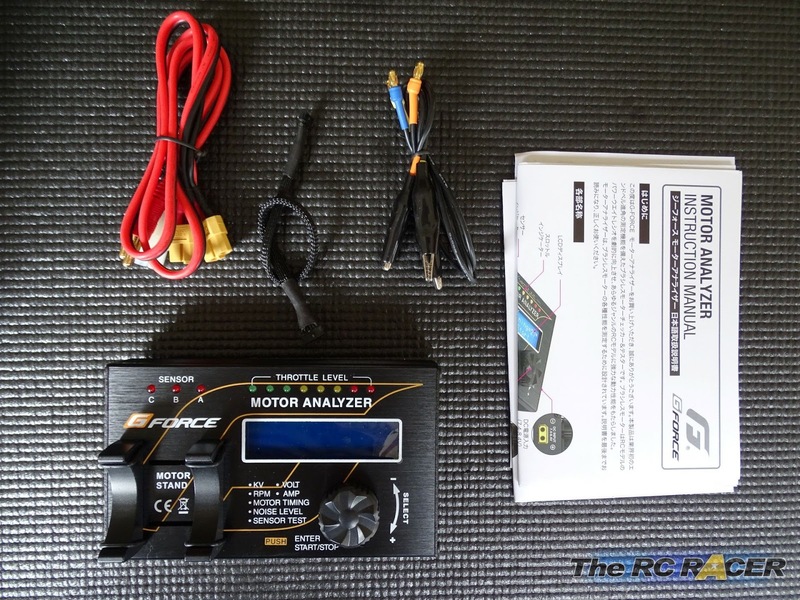 I got a very similar read out on both for KV and amps, however on the track the D4 is noticeably quicker as it has more torque. This shows you that you only get part of the story with this device. It will not replace a full motor dyno such as those sold by Eagle racing. Although it is much cheaper. 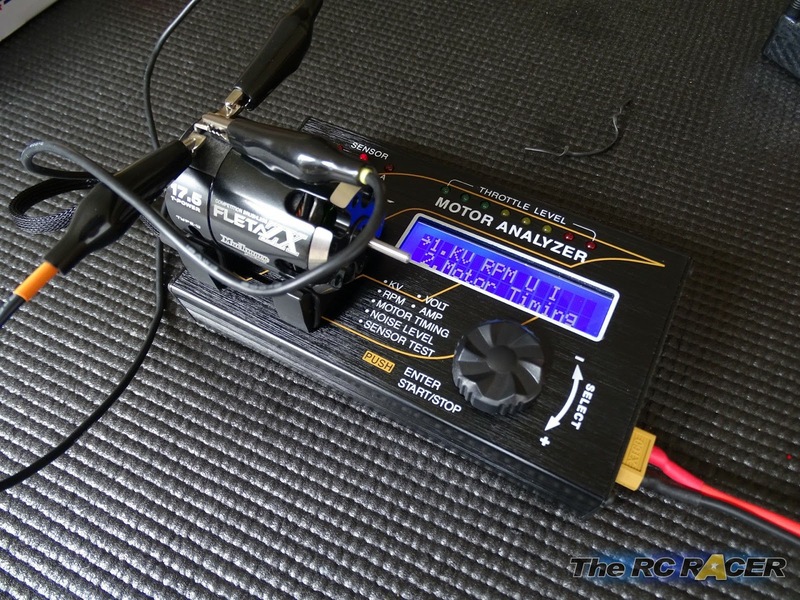 I think as a device it would be good to share with a group of friends, you can all take it and look at your motors. 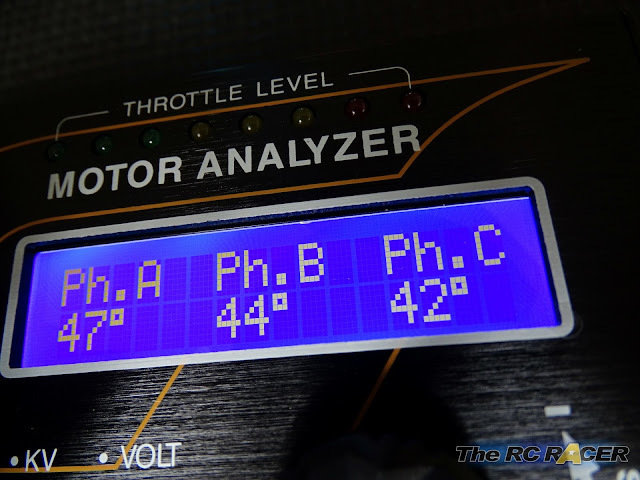 It can help you tweak your motor a little, and the KV and Amp rating is very useful to play with finding a theoretical 'sweet spot' to start with at the track before you test the car more. Also if you are not running blinky this is not worth bothering with, once you start adding boost and turbo you are bringing in a load of variables that will have a much bigger impact on the motors performance and temperatures than your base timing setting. So am I faster, maybe a little bit, but that might just be more because I have a better idea of what my motor is trying to achieve. The motor analyser does help me have a good idea of why one motor is quicker than the other, and why some motors were getting much hotter. So it feels like a luxury purchase more than an essential one.